As you will learn in more detail as you continue reading, faction Jumpgates (or "Home" Gates) are the only place where you can spawn ships without resources. Not only that, but Home Gates can only spawn small ships like transports and engineering vessels. Shipyards are structures that allow you to spawn at certain planets. On these planets, resources can accumulate, allowing the construction of larger, more powerful capital ships. Any ship can be built at a Shipyard, but they all require resources. Spawn locations are indicated by white icons on the selection map. Double-click on a location to center your camera on that location. Some ship names may be shown in red, this means they cannot be flown, usually due to the player not meeting the rank and badges requirements to fly that ship. 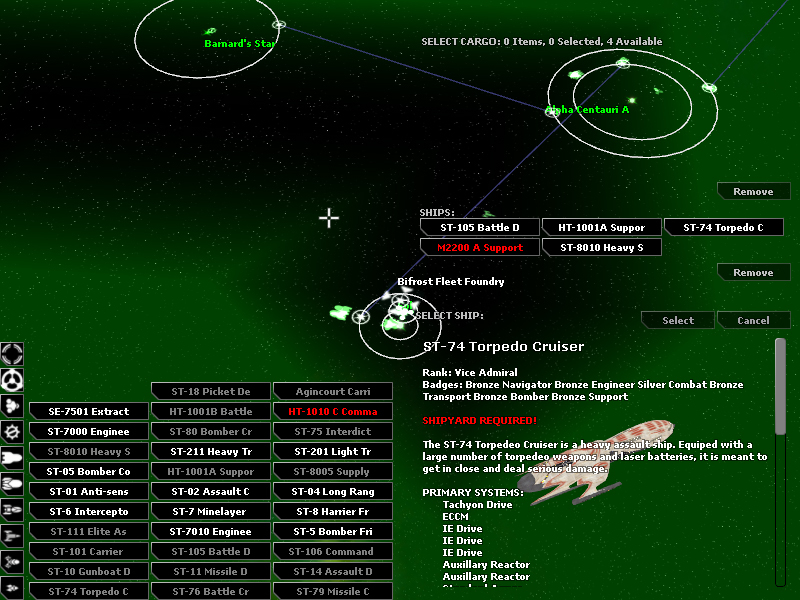 Ships with names shown in grey cannot be spawned from that location because the ship requires a shipyard, or the planet does not have a high enough technology level or enough resources. When you choose a spawn location, you can choose to spawn at the Home Gate or at a shipyard. Each shipyard choice allows you to examine the resource caches of every planet, which you will understand more about as you continue reading. Certain parts of the metaverse server are designated for lower ranked players, this includes Ursa Minor, which is the default spawn area for all new players. 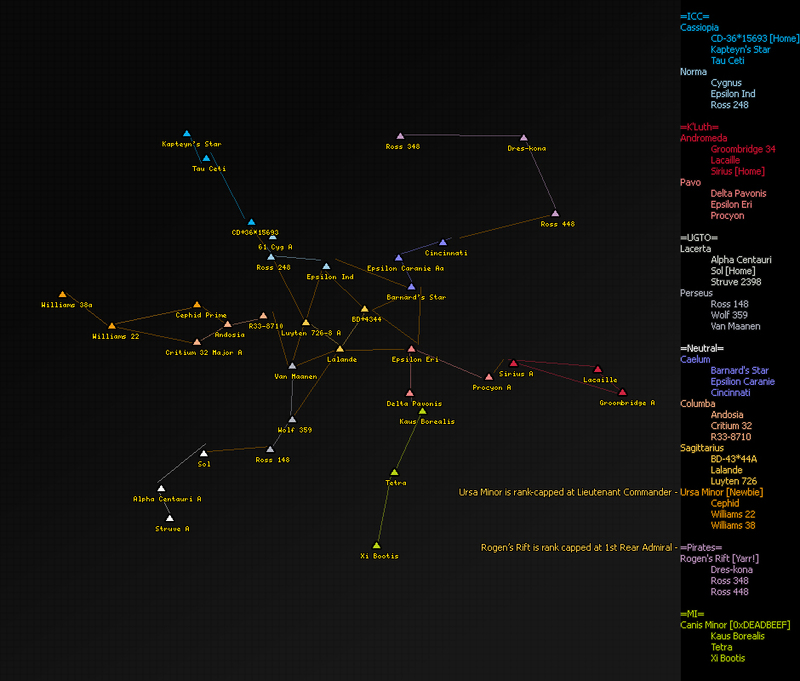 These areas have a rank cap in place, above which you will not get credits for any prestige-awarding actions. There are 7 zones within the metaverse, called constellations or clusters (not to be confused with planetary clusters). Andromeda - K'luth home territory. No rank cap. Cassiopeia - ICC home territory. No rank cap. Lacerta - UGTO home territory. No rank cap. Procyon - Stronghold for an unknown mechanical race. No rank cap. Rogen's Rift - Haven for pirates and other renegades. Max rank of 1st Rear Admiral. Sagittarius - Most contested space in the metaverse. No rank cap. Ursa Minor - Designated newbie area and default spawn area. Max rank of Lt. Commander.